It has come to my attention that there has been some winter damage on crape myrtles. The organiphobes who are heavy into crape myrtles these days are giving out some really bad advice. They are saying to cut the dead stems back to the ground, which is fine, but this should only be done on completely dead stems. Then the recommendation goes on to advise fertilizing the trees heavily every 6 – 8 weeks with a high-nitrogen fertilizer, which means synthetic fertilizer of course. That’s horrible advice. Gentle organic fertilizer such as aerated compost tea or one of the natural meals is all that should be used. Now let’s discuss why these trees had freeze damage in the first place. Sure it got cold, but only some trees had damage. It’s true that some varieties are weaker than others but all are weaker when fertilized with the high-nitrogen, synthetic fertilizers. 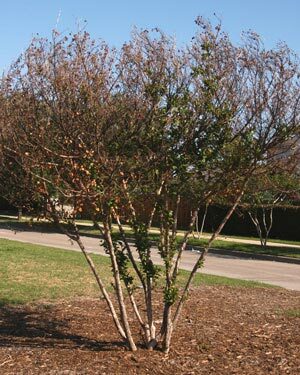 This is the photo used in one of the newsletters showing a crape myrtle that is at least 6” too deep in the ground. It’s too bad that the recommendation wasn’t given to uncover this tree’s root flare. Without question, trees in stress are more sensitive to freeze damage and without question, buried root flares causes stress in trees.